I never ever thought the Cars 2 campaign would get around as much as it has. Friends have been e-mailing me about different places where they've seen them. It made me want to gather as many photos as I can of them out in public. For me, stuff like this doesn't happen very often so I definitely would like to create a personal photo archive to capture this experience. This is where you guys can help. 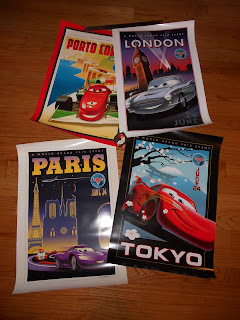 And I'm willing to part with a few of my Cars 2 mini-posters (I have 2 each of the 4 different international cities) for the effort. All I'd really need is a shot of any of the 4 posters you see above, anywhere you find them in public (Just like the one of above, I'm that little dot). Only one photo per person/e-mail address will be accepted & I'll count only the entries received before 12PM Pacific Standard Time on July 30th, 2011. The 8 winners will be drawn at random and all photos I receive will strictly be used for my personal archive and/or blog. All winners will be notified via e-mail. Send jpegs to eric.tan.scavenger@gmail.com, along with your first name and the location where it was shot. I can't wait to see what you guys come up with! Thanks in advance for the help! 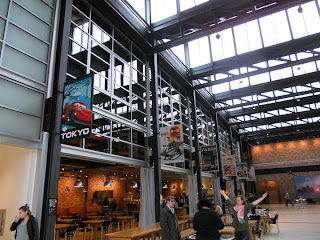 That's me in the middle of one of the coolest places on earth, the atrium at the Pixar Animation Studios in Emeryville, California. 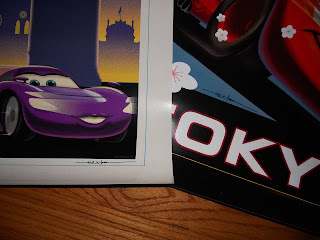 They were nice enough to hang up the Cars 2 posters I had worked on along with my coworker Stephane Kardos and Pixar's Harley Jessup, John Lee, and Craig Foster. 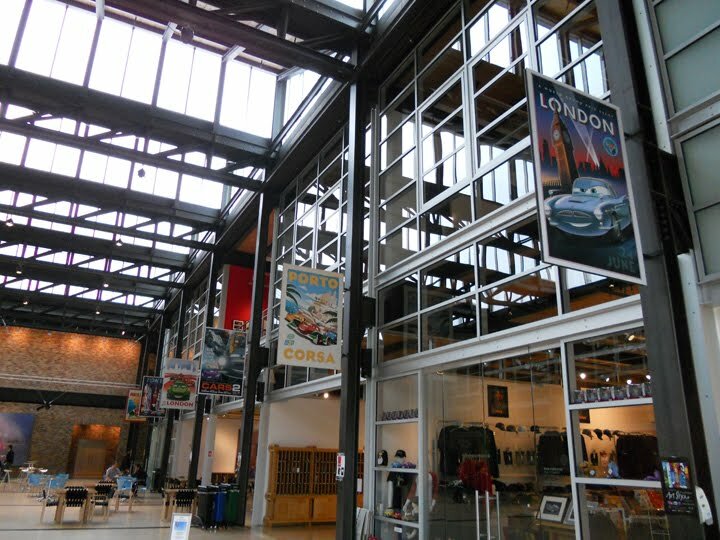 When you enter the Pixar campus, you can immediately feel the creative energy in the air. There's tons of development art, maquettes, and huge statues of many of their beloved characters everywhere you go. It's quite an honor for me to visit the place where all of those amazing films are generated and it's an even bigger honor to have something I worked on hanging up anywhere in their building, let alone the main area. Amongst my daily duties at work, the posters are definitely the most difficult and time-consuming projects. I believe this particular series stretched over 4 or 5 months. They also are the most fun because they combine everything I like to do - layout, illustration, and typography. 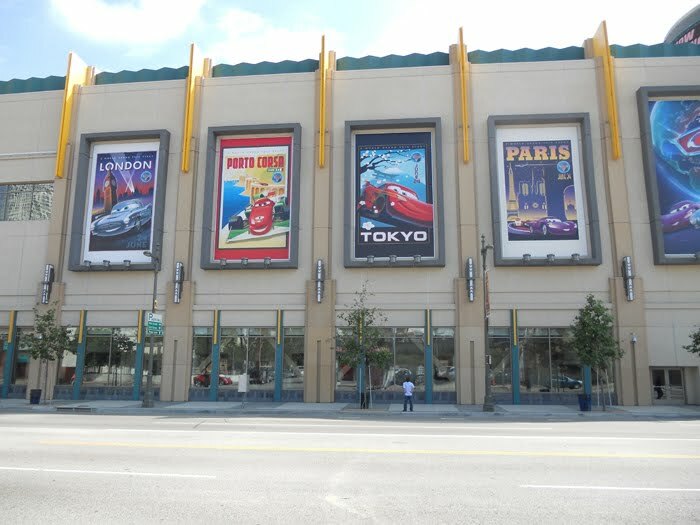 When i was 15 or so and on vacation in Los Angeles, I remember asking my parents to drive by the Disney studio in Burbank. I just wanted to see Mickey's Sorcerer hat which pinpointed the exact place I wanted to someday work at, Disney Feature Animation. I worked tirelessly on my drawing and painting all throughout high school so that I could get into a good art college and hopefully one day, into Disney. What I didn't find out til I took animation courses in college was that I was HORRIBLE at it! I have A.D.D. which also means I can't stick to something for very long and the slow animation process really took a toll on me. To this day, I have the utmost respect for all the amazing animators out there because it really is a special set of skills they have. With animation not being a realistic option, I decided to pursue a whole different type of art. My major in college switched to Graphic Design. I had taken a few classes in Junior College and really enjoyed them. The projects were just as challenging and the turnaround seemed a lot faster. It really did satisfy my interest in illustration and typography and I instantly gravitated towards poster design because it completely integrated the two. I was content within the world of Graphic Design, but I was also a little disappointed that my childhood dream of working at Disney was drifting further and further away. I lucked out one afternoon in my Editorial Design course when my instructor, Carla, asked me what my goals were after I finished college. I told her about my early goals of working at Disney and how I didn't believe that was possible anymore. That left me a little lost until she mentioned that a former student of hers worked at Disney Consumer Products as a graphic designer. I was completely blown away because I didn't even know they had positions within the company that involved what I was now learning in my design courses. She immediately connected me with her former student, Marcella, and I started working at DCP a week later. To say I was thrilled to make it to the Mouse House was an understatement. I wasn't really sure at first what I would be working on, but I just thought that if I stick to it and work really hard, I'd make it onto the Disney lot for a tour of the place I dreamed of working as a kid. That was about 12 years ago, and since then I've been very fortunate to work on products for all of the Disney and Pixar films that have been released throughout the years. The fun I had designing posters in school has translated into the ones I've created for all of the Pixar films, starting with The Incredibles. I've been extremely lucky to work with all of the talented people within my company and we've all been blessed to get to do our childhood hobby as adults. 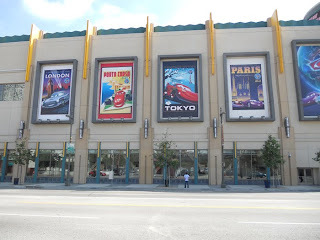 The Disney Lot has always been a special place for me because of the memories I has as a kid, driving by on the 134 and wondering what amazing stuff was going on within its walls. Nowadays, every time I walk around it to get to a meeting or a screening, I definitely get a sense that to be a part of it is an amazing & magical thing. I feel very fortunate to be there and it definitely puts a smile on my face every time. The old animation buildings, the water tower, the gigantic sound stages, and of course Mickey's sorcerer hat which sits atop Feature Animation - they all are as cool now as I thought they were when I was 15. Yesterday, I was walking along one of the busy corridors between the sound stages towards the commissary. On the way you pass the massive billboards that promote Disney and Pixar's latest and greatest films and shows. In a million years, I would never expect to see what I did on those walls, the Cars 2 series that I worked on a few months ago. I was completely floored. As a kid, you can sometimes have these wild dreams of what you want to be when you grow up. After watching Jungle Book when I was 5, the only thing I ever wanted to do was to work at Disney - in any capacity. I remember even wanting to be a ride operator at Disneyland. I guess I just never stopped working towards that goal. 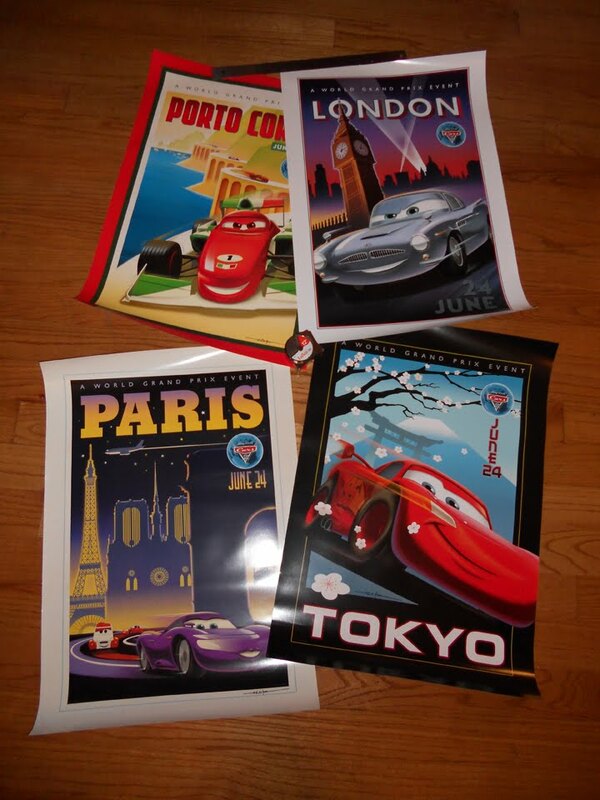 When I saw those Cars posters, I felt a sense of relief - that all that hard work paid off and I was on the same lot I had always wanted to work on, staring at these 25 foot posters that had been on my little computer screen for all those hours. I also thought of how many 15-year-old aspiring artists who were just like me will pass by them, and be inspired to create their own art and maybe even want to work at Disney one day. I'd tell those kids to work their little hearts out while continuing to have fun and live life. I'd also tell them to hurry up!!! Considering my workload these days, I can definitely use the help! !